Are smart people born or made? But what one can say for sure is that with a little time and concerted efforts anybody can become smart. In fact, there are several simple ways and means using which even an ordinary person can boost his/her mental abilities to lead a successful life. It all boils down to challenging our brain with new tasks so that it remains alert and performs when we need it the most. 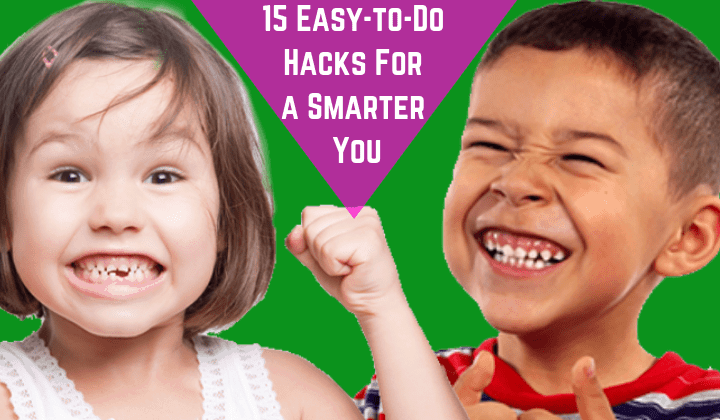 So if you want to become smart and do better in life, here’s a list of 15 simple DIY tasks and activities that you can do to get your brain buzzing at optimum capacity. The most important step to be smart in no time is to keep on challenging yourself. Once we have achieved a semblance of success in our life, it’s effortless to lull ourselves into a false sense of complacency. What we fail to understand is that success is never permanent. We need to keep pushing ourselves mentally to ensure that we never lose it. By challenging ourselves, we are not only exploring the furthest limits of our own potential but also ensuring our brain stays alert at all times. Music can do wonders for the mind, body and soul. Learning a musical instrument requires strong focus, excellent hand-eye coordination, deft mathematical calculations and intense concentration. All of which provide great fodder for the brain and eventually end up being smart. Playing a musical instrument is also known to boost a person’s cognitive abilities and enable different areas of the brain to work together seamlessly. Exercising regularly is also essential to keep the brain fit. Various studies have shown that people who exercise daily boast of higher IQ scores. It not only helps to keep us fit but also helps us to become smart and active. Regular exercise is said to substantially increase the production of neurotransmitters and initiate a chain reaction which promotes the growth of new neurons which improves brain health significantly. If you’re already exercising regularly, you’re probably following a healthy diet as well or know the importance of one. For best results, you could increase your intake of known brain-booster foods like fatty fish, blueberry’s, coffee, nuts, dark chocolate and broccoli. Similarly, it’s best to avoid harmful foods with high trans-fats like cakes, chips, microwave popcorn, breakfast sandwiches, doughnuts and biscuits. Did you know to meditate for a short time every day can do wonders to your powers of concentration, creativity, alertness and IQ levels? Research by several reputed universities like UCLA and Yale University has revealed that regular meditation is beneficial for brain health. Doing it for an extended period of time can also boost the mental health of older people. It’s also known to boost memory and learning capabilities and reduce pain, anxiety and depression among people who do it on a regular basis in order to think smart. Try to invest 30 minutes from your busy daily schedule into learning a new language. It could be the best investment you ever made. Learning a foreign language forces your brain to work harder. Trying to read, write and converse in an alien language begins a complicated mental workout that triggers different areas in your mind. The more you push your brain to understand new terms and words, the harder it has to work, becoming smarter in the process. Another best tip to be super smart is by indulging in some brain teasers like Sudoku, Scrabble and many more. Ok, so they might not be as much fun as some of the more popular games online, but they can do wonders for your brain’s cognitive abilities. There are several online sites and apps which offer simple educational games designed to test, evaluate and improve your mental abilities. Marketed as a means to increase a person’s fluid intelligence and problem-solving life skills, these online options are already finding a lot of regular followers online. It’s believed that a lot of smart people prefer seclusion to avoid being over critical of others. However, a real smart person does just the opposite. Working and interacting with others as a team helps develop new ideas, builds new bonds, boosts team spirit and opens your mind to new perspectives. It also forces the brain to think out-of-the-box and stretch its resources into unfamiliar territory. Rapid advancements in technology have blessed us with several useful devices. But on the flip side, it has also made us extremely lazy, careless and prone to taking short-cuts for everything. For example, mobile phones have ensured we don’t remember phone numbers anymore. The GPS in your car makes sure remembering the precise directions to your friend’s home is no longer a necessity. Try to do the simple things to be smart in life without relying on tech tools. You may be amazed at the effect it has on speeding up your mental faculties. You can also try turning off your phone and other devices on the weekends and holidays. It is the only way you will ever be able to make the time to sample life’s simpler pleasures. It will also allow your brain to reboot, by diverting its attention from the usual mundane issues to process newer pursuits like a surprise game of football, an unplanned drive with the family or even an uncharacteristic trip to the supermarket. So make sure you take time out from your busy professional life regularly- you’ll end up managing your time better and working smarter too. The simple act of reading is known to stimulate the brain like none other. And yes, it also makes you a lot smarter. Reading requires concentration, memory power, data management skills and analytical capabilities – in short, every possible attribute needed to stimulate your mind and make your brain work faster. Books on social topics enhance your critical thinking, while fiction improves your imagination. Reading also helps to update your vocabulary which leads to good communication skills as well and fills your mind with new information and knowledge. One of the best ways to be smart and active– is by spending quality time with people you consider to be smarter than you. It’s also a great way of gaining new perspectives on a wide range of issues and learning. It will teach you a lot and identify the areas where you need to improve to be just as smart as them. This is not to say that you stop being friends with your regular pals, but you can always rejig your priorities to spend more time with people who can push you in the right direction. Yes, it may seem awkward at first, but travelling to new places is a fun way of shocking your brain. For example, when you enter a new eatery, you can’t merely yell – ‘the usual’ – to the waiter. You have to first study the menu, make a selection and then place your order. Unfamiliar places, new people and experiences compel different parts of the brain to work collectively and find new ways to express our thoughts. There are two ways of approaching this. Either you can continue getting stressed over your usual work-related issues, or try thinking of new and innovative ways to beat the stress. Now and then we are faced with problems and issues that give us the opportunity to think of out-of-the-box solutions. But most of us tend to continue beating the stick to a familiar tune out of sheer habit. Approaching a problem with a fresh perspective allows our mind to come up with creative solutions to the issue – which keeps our mind active and helps us to think smart. The credit you will get for your fresh ideas is merely the cherry on the cake. Since there is a good chance that you are doing this one anyway, I have saved it for last. Now there is ample research to show that stimulants like coffee help to keep you awake. But did you know that coffee also inhibits a sleep-inducing protein called adenosine? A reduced flow of adenosine allows more neurons to fire in your brain. This works like shock treatment for your brain, enabling it to reach a heightened level of cerebral activity which allows you to make faster, smarter decisions. The level of intelligence we possess can be measured, but it’s seldom a fixed quantity. Some scientists have gone to the extent of defining a person’s average level of intelligence as – a constant work in progress. And subsequent research has proved that they are right. How we live our daily life, approach everyday situations and what we feed our brain has a significant bearing on how smart we are and how much smarter we can be. So if you’re on the quest to be smart, try out some of the simple hacks we have listed above and remember to let us know how they worked out for you.